An alien visitor to our shores might be forgiven for thinking that the United Kingdom is composed not of four nations but five. 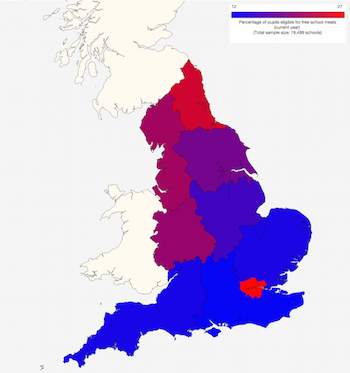 There's so much talk of a north-south divide that it is tempting to think of northern and southern England as culturally, economically and politically distinct. What about educationally too? The purpose of this post is to explore these trends in more detail. Interestingly it turns out that although there are a lot of north-south differences, not all of them conform to regional stereotypes. As you can see, at this level it's pretty hard to distinguish between the north and south of the country. Nevertheless, the differences I talk about below have (unless otherwise stated) shown consistent patterns over the years for which comparable data are available (typically 2011-2014). They also represent thousands of schools and hundreds of thousands of pupils each year, so whether large or small they are real effects not just statistical flukes. OK, what do the data say? To understand what's going on it's worth starting with levels of deprivation and spending (see also spending by parliamentary constituency to get a finer-grained view). These are both higher in the north than in the south – with the important exception of London, which is highest of all regions on both measures. In fact London, shows a really interesting profile all of its own: in some ways (deprivation and spending) it is more like a northern region than a southern one, yet in others (certain measures of academic attainment) the reverse is true. There are other interesting, if perhaps less consequential, financial differences between the north and south. For example, schools in the south are better at raising 'self-generated' income – mostly parental contributions of one kind or another. (Note that this measure has a clear east-west axis as well as a north-south one. I've no idea why.) Also, schools in the north have higher energy costs (ie, heating and lighting) than those in the south (see also the equivalent constituency view). In both cases, these differences typically amount to only a few tens of pounds per pupil per year, and even if you add them together they generally come to less £100 a year per pupil (around 2% of budget). But in aggregate that's still a difference of hundreds of millions of pounds a year, just in parental contributions and energy costs. There are also significant north-south (and east-west) differences in things like premises and catering costs. (Once again, London is an outlier here.) However, I suspect that these may be supply-side rather than demand-side effects. In other words, schools in the north (and London) probably tend to spend more on these things because they are given more money for them as a result of their relatively high levels of deprivation. In support of this view, we do indeed see higher levels of grant funding per pupil in northern regions (see also the equivalent constituency view) – though they have nothing on London, which receives easily the highest amount, focused in particular on inner-city areas. Now let's look at what many people think matters most: academic attainment. At the end of Key Stage 1 (ie, 7 years old) there are clear north-south trends in maths, reading and writing. The absolute differences are relatively small but (with one important exception that I'll come to) are very consistent from year to year. Interestingly, the North East has improved its KS1 writing attainment over the last few years (compare 2011 to 2014), but not maths or reading attainment. The bigger change during that period, however, (and the one I alluded to above) is the rapid rise of London on all three measures of KS1 attainment. For example, compare the 2011 maths results with those in 2014. (You'll see very similar patterns in KS1 reading and writing.) However, the range of different regional scores has narrowed during the same period (from about 6 percentage points to about 4), so the overall north-south performance differential has stayed almost static at around 2 percentage points. What's driving these differences in attainment at 7 years old? In a word, deprivation. Correlation is not causation, of course, but it's striking that the overall pattern of KS1 attainment is almost identical to the pattern of deprivation. For example, look at KS1 maths attainment in 2011 (below left) and compare it with the distribution of deprivation in the same year (below right). Note that the latter uses a reversed colour scale to make the similarities easier to see. London has now completely bucked the trend: it has very high levels of deprivation but also quite high levels of attainment. In contrast, northern regions have if anything got worse, even allowing for their higher levels of deprivation. All this appears very reassuring for those seeking social and geographical equality – until you look at the GCSE results. Here the north-south attainment gap reappears with bells on. This regional difference has existed since at least 2011 (which is as far back as the readily available data go). Nationally, around 60% of pupils leave secondary school with at least five GCSEs at grades A*-C (though of course the exact figure fluctuates from year to year). In 2011-2013 the gap between north and south was around 2.5 percentage points (again, a bit higher in some years and lower in others), but in 2014 it jumped to 4.8 percentage points and the preliminary 2015 GCSE results just released by the Department for Education (see again the map at the top of this post) show that, at 4.6 percentage points, this gap was more or less sustained, indicating that the 2014 increase was not just a blip. At A-Level, there is a north-south attainment difference of about 3 percentage points, but there is no clear gradient along the length of the country. True, the East of England, London and the South West all do well, but so does the North West, and the South East performs poorly. Of course, this metric represents only that subset of students who stay on in education beyond 16 (around 65% in the north and 70% in the south), so it's hard to draw any direct links with the results up to GCSE. That said, it's surprising how poorly the South East fares at A-Level given its relative strengths in earlier phases of education. In summary, regional performance at 7 years old seems to correlate closely with deprivation, except in London, which does unusually well. Between 7 and 11 years old, northern schools tend to make better progress, but once those kids go to secondary school their average performance falls well behind their compatriots in the south. One question, then, is whether the secondary-school system in the north can emulate the success of the primary schools there. A pessimist might say that the north-south gap in GCSE attainment has been around for years and has increased of late, so we would expect to see it continue or even grow. An optimist could counter that we're now seeing good GCSE performance spread beyond London and the South East, and that we might expect it spread north too. Moreover, London demonstrates that economic deprivation doesn't necessarily lead to educational underperformance. I instinctively tend towards optimism, but in truth only time – and data – will tell. Data are important; you won't get anyone here at SchoolDash HQ saying anything different. But personal experience and anecdote are critical to our understanding too. To have one without the other is a bit like having a hi-res copy of the Sistine Chapel ceiling but only in black and white, or blueprints for the Sagrada Família without the opportunity to actually enter its amazing space. Which is why, following all the recent buzz about coastal schools, I was fascinated to receive an account from a person who used to attend one. I'm reproducing it below, anonymously but with permission. It paints a depressing picture but speaks to several important truths, such as the sense of isolation in some communities and the huge gulf that often exists between schools just a few miles apart. It also offers a practical suggestion for helping to improve things – one that isn't directly connected to education but might nevertheless help the schools concerned. I therefore thought the contribution worth sharing. It concerns this area and the town in question is at its southernmost tip. I read the recent article in the BBC news with great interest, as I grew up in West Sussex and still regularly visit the area, and can attest to the conclusions there, presumably based on your studies. In particular, I note the stark difference in achievement between the two secondary schools in Chichester (one of which I attended) and the one in nearby Selsey, which was known as a sink hole school even then and still is by all accounts. And the difference between the two towns is similar: Chichester is a thriving and lively local hub and a pleasant place to visit, with relatively good transport infrastructure. By contrast, Selsey is a desperate place to live, lost to the modern world, cut off by the sea on three sides and with only one poor quality road connecting it to Chichester, which is prone to flooding and also to hopeless traffic jams, making it nearly impossible to get in or out of the place at peak travel times. So difficult is it to get to indeed, that it does not even have much of a tourist industry that I'm aware of. To underline the point, I lived in the region just 4 miles away along the coast from Selsey for over 20 years and still regularly visit my parents there, and I have only ever visited Selsey once in my entire life and it isn't an experience that I am in a rush to repeat, and I don't think that my parents have ever visited the place, despite having lived in the area for nearly 60 years now. It is one of those towns where the overriding impression one gets when visiting is "why is this place here? ", closely followed by "what do people do here" and then "why don't the people here leave?". Why indeed don't they, and so growing up in such an atmosphere surely would hardly encourage a spirit of enterprise and ambition that is needed to get on in this world, would it? I can't offer any easy solutions to such a problem place (let alone solving it's educational needs), but improving the towns transport links would be a good start. For instance, although the (rather upmarket) village of West Wittering (which does not have the best transport links either) is but 4 miles away straight along the coast from Selsey, there isn't even a direct road between the two. Instead you have to drive most of the way to Chichester first, and then out again - a trip of nearly 16 miles, which has always struck me as ludicrous, but not even the slightest effort has been made to rectify it. It really does seem as if Selsey has been forgotten and abandoned by the outside world as well as itself. If it were a dog I'd put it down, but I hope and trust that with a bit of effort it can have a better future than that. Once upon a time it was inner-city schools that made educationalists fret, now it's those by the shore. As we've previously written (and as covered elsewhere too), schools in England's cities, especially London, have enjoyed a rebirth over the last decade. Where once they were synonymous with failure, they are now among the very best in the land. So attention is shifting a new geographical category: coastal schools. Driven at least in part by declining industries, high levels of poverty and relative isolation, some coastal communities are struggling to raise high-achieving pupils, as described in a recent report from The Future Leaders Trust. Here at SchoolDash we like to be guided by the data and have had an interesting time over the last few days studying the numbers along with BBC News education correspondent Sean Coughlan, who has just published an insightful article on the topic. According to our analysis of preliminary 2015 GCSE results recently released by the Department for Education, an average of 54% of pupils at coastal schools (which we've defined as those within 5km of the shore) obtained five good GCSEs while the figure for inland schools was just under 57%. This may seem like a small difference, but it's been very consistent for at least the last five years (the period for which directly comparable data are available), ranging between 2.8% and 3.3% during 2011-2015. More importantly, this difference of a few percentage points represents many thousands of pupils each year. As ever with sweeping national generalisations, this trend encompasses a great deal of local variation. Looking at the individual schools concerned and the subset of coastal schools immediately suggests a complex national picture. But there are also clear local trends. Among the areas showing the most significant coastal-inland differences in 2015 GCSE attainment were Essex (17 percentage points), Suffolk (17), East Sussex (16), North Yorkshire (15), Kent (8), West Sussex (8), Cumbria (7) and Hampshire (6). 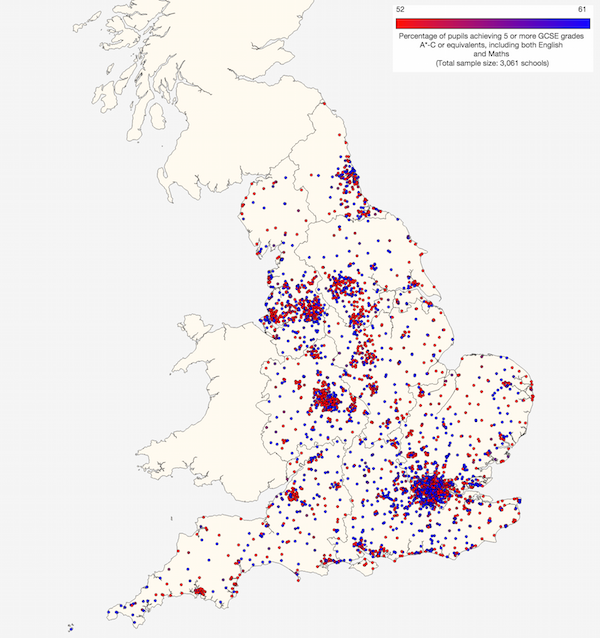 (In all of the maps linked to here, blue represents high GCSE attainment and red represents low attainment. The dots show individual schools. Hover your mouse over an area or school to see corresponding names and data, and click on a school to go to its SchoolDash profile page.) There were a few exceptional areas that bucked this trend, most notably North Tyneside (where coastal schools did better by over 8 percentage points ) and Lancashire (just under 8 percentage points). Underperformance in secondary education is often blamed at least in part on poorly prepared pupils coming up from primary schools. There's some evidence for this in the numbers. In 2014 (the most recent year for which data are available), an average of 78% of 11-year-olds at coastal schools achieved the expected standards in reading, writing and maths. The corresponding figure for inland schools was 80%. However, this is a much smaller proportional difference than that seen at 16 years old, and those areas with big differences at GCSE do not necessarily show correspondingly large differences at 11 years old. Examples include Essex (4 percentage points), Suffolk (3) and East Sussex (5). West Sussex coastal primary schools actually have slightly higher attainment than their inland counterparts. The one area showing consistently large coastal underperformance at both 11 and 16 years old is North Yorkshire (where coastal primary schools are 10 percentage points behind). In line with the conventional narrative about coastal schools, academic underperformance correlates to some extent with deprivation. See for example, these maps of eligibility for free school meals in Essex and Suffolk. (Here high levels of deprivation are shown in red in order to make them correspond to areas of underperformance in the attainment maps above.) But this is not universally true: North Tyneside has slightly lower deprivation near the coast. However, as is also evident from the maps, almost every under-performing area has at least one or two schools that, for whatever reason, are doing rather well – and vice versa. So on the face of it, geography is not destiny on our coasts any more than in our cities.